It was 10:30 on a warm Saturday morning in June, and my friends and I decided to go to the newly opened Hatch for brunch. Located on Main Street in Huntington Village, we were not surprised when the hostess told us there was an hour wait for a table. Hatch does not take reservations, so we gave the hostess our phone number, walked around town, and received a text when our table was ready. Hatch opened in April, and their mission statement reads, “We are here to change the perception of the typical brunch.” They did just that! This restaurant definitely took brunch to another level. The restaurant is decorated in blue and yellow and is very aesthetically pleasing. It had a Manhattan feel to it, which I feel is missing from the other restaurants in Huntington. The navy blue exterior, art on the walls, and a bright yellow door draw in tons of foot traffic. Round tables with yolk colored round booths fill the restaurant. The bar in the back of the restaurant has a neon sign that reads, “My Happy Place.” The bathrooms contained painted signs on the mirrors that said, “You look fine” and “What are you looking at?” and the attention to detail really contributed to the experience. We sat down and were so excited to order. The menu was colorful, and every item sounded really appetizing. I couldn’t decide what to order! 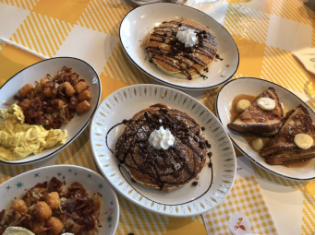 As if this new brunch spot didn’t already have a lot going for it, Hatch is also very cautious with allergies, and the pancakes can even be made gluten-free. The prices were extremely fair, ranging from $8.75-$13 per entree. Our waiter was very friendly, and due to the long wait, we ordered right away. I ordered buttermilk pancakes topped with chocolate ganache, Nutella, chocolate chips, and fresh whipped cream. It was so sweet, flavorful, and huge that I could not finish the whole thing. Some of my friends got the “Tots and Eggs” entree, which is hash browns and tater tots covered with cheese, bacon, breakfast sausage, and two eggs. Hatch prides themselves on using eggs that are both cage-free and organic, adding to the already fresh flavors in their food. Other popular menu items include peanut butter and banana stuffed french toast, cinnamon roll pancakes, avocado toast, and loaded breakfast burritos. All of their items are plated beautifully and make for a perfect instagram photo op! Hatch was definitely worth the wait and the perfect spot for brunch! Hatch is open daily from 7 AM to 3 PM. I recommend ordering whatever you want; your summer diet can wait!